The Samsung Galaxy S7 is this year’s device to beat: a showstopper, a juggernaut. But there’s one problem with it: it’s incredibly boring. It’s proof that smartphones have hit a dead end and that something needs to be done to make them exciting again. Earlier this week, Samsung began releasing a series of YouTube videos intended to poor fuel into the Galaxy S7 hype engine. This Seven Days of Unboxing campaign provides a humorous look at a series of unlikely creatures being given 30 minutes inside a futuristic box containing a Galaxy S7. One such fortunate creature was a llama named Kuzco. 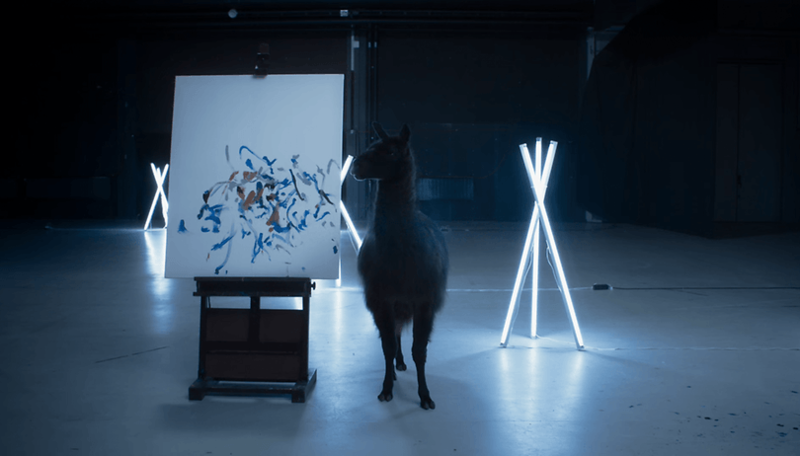 Following Kuzco’s half-hour examination of the device, he wields a paintbrush in his little llama mouth and attempts to portray what he witnessed inside that closed-off box. He produces a series of colored smears that, while showing a deft understanding of negative space, tell us nothing about the phone. These videos are fun, but they also expose a deeper problem: there’s nothing exciting to see when unboxing a Samsung Galaxy S7. The Galaxy S7 looks exactly the same as the Galaxy S6. It’s on par with when Shreddies released Diamond Shreddies, except the joke is entirely on us this time. What we’ve got is a slightly more rectangular home button and a marginally flatter camera bump. Oh, the edges of the screen are a bit more curved, too. Ultimately, any casual observer would struggle to tell it apart from the S6. Samsung made the decision to keep the design the same, essentially, to save money, following in the footsteps of Apple, who release phones with much the same design every year and reap in 95 percent of the smartphone industry’s profits. For Samsung, the move makes financial sense in the short term, but does it in the long term? Personally, I own a Galaxy S6 and have absolutely no inclination to buy a Galaxy S7. Without something interesting, worth taking note of, what, other than habit, will encourage people to buy or upgrade to the new Galaxy S7 or the S8 next year? Water-resistance is one of the features we’ve heard rumored for some time now, to the extent that it's all but certain. Samsung is just trying to put a dampener on our expectations, so we do have some sort-of surprises come the big day. The Galaxy S7’s most exciting feature is one that was dropped from the Galaxy S6: microSD card support. This was either an incredibly adept and insidious bid on Samsung’s part, depriving us so that we would herald the feature’s return, or else the company realized that it needed to include a feature people actually want, and that happened to be an old feature. Either way, the return of an old feature is hardly the show-stopping announcement anyone would hope for from such a goliath of a device. Force Touch, a pressure sensitive display, allowing for additional options based on how firmly or softly a user presses on the screen, has long been rumored to be one of the Galaxy S7’s primary selling points. It’s too easy to point out that Samsung is playing catch-up to Apple on this one. But that doesn’t really matter because it would be the first Android flagship with the new tech that people are going to buy in considerable numbers - i.e. it's not the Huawei Mate S press touch. If it turns out to be included on the device, this will be touted as a big one; fireworks will pierce the air as a video screen shows all the capabilities of Force Touch, heralding a new era in smartphone use. The truth is that most people won’t use it. What Force Touch essentially is is a third method of input, so we have a tap, a long press and a force touch. There’s no doubt that this has the potential to improve UI navigation on smartphones. But when it will actually become useful, and to what degree, remains wide open to debate. At least on the iPhone, app developers know that everyone who has a new iPhone will have 3D Touch. On Android, only a minuscule fraction of the userbase will have Force Touch devices. The incentive for app developers to include Force Touch features in their apps is next to zero, and it will take a long time for the feature to become ubiquitous, if indeed it ever does. At the minute, it's little more than a gimmick. And I'm not keen to spend my time force touching the screen on every app to find out whether anything happens or not, especially when it will mostly be the latter. Samsung is a big fan of the numbers game. Every year it seeks to beat its own records on pixels per inch, processor benchmarks, GBs of RAM, and camera sensor size. Most of the time, this is purely for bragging rights. No one is going to notice more pixels per inch at this point, and a more optimized OS and UI would mean that 4 GB RAM is unnecessary. The most dramatic news to arrive in this domain is that the camera's MP count is actually dropping on the S7: from 16 to 12 MP. It’s perhaps the only area where Samsung has shown any guile or confidence. Let’s hope their dual-diode technology is up to the challenge of surpassing the public outrage at the loss of those 4 MPs. Personally, I believe it will be. If there’s one area where Samsung does truly excel, and not just in a ‘my numbers are bigger than your numbers’ way, then its camera technology has to be it. And let’s not forget that there are plenty of phones on the horizon that are trying new things. Now, I’m not saying that all of these are necessarily good ideas, but experimentation is key, especially right now. The Nextbit Robin, a smartphone that lives in the cloud, not only looks unlike any other smartphone, but it brings a new way of functioning to the table, too. Project Ara looks to bring modularity to smartphones, letting you replace and upgrade pretty much any part of the phone you want, whenever you want. And Google’s Project Tango is coming closer and closer to fruition. This last one might remain pretty conceptual for a while yet, but, to me, augmented reality in smartphones seems like something truly big and exciting to look forward to. Do you think enough is being done to make new flagships exciting? Would you buy a Galaxy S7? Let us know in the comments. Good catch, Glostermeteor! I've corrected that now. Probably can't find anything else to copy? the only thing that was different was the edge? and it was a useless idea? Completely agree on the Nextbit Robin stuff. It seems like a sincere attempt at improving usability. Explain how having all your info on a company's server is better than having the info directly in your phone on a Micro SD card. It makes you totally dependent on the internet to access your files. You are then a the mercy of your service provider or your Wi-Fi speeds. What if you can't access the internet and need your files? The cloud is just a money making scheme and nothing else. Agreed. And probably one of the reasons micro SD card capability was removed was an attempt to move users to keeping their stuff on the cloud. Particularly if you have a smartphone with 16 GB of storage. Just saying. For gods sake. Guess what? Force touch is unnecessary. Fingerprint scanners are unnecessary. Curved displays are the dumbest and least practical things I've ever heard of. Cloud storage is dumb, impractical and unreliable. The truth is that there's hardly anything left to innovate. Even budget smartphones today have more than enough for your needs. Companies should just be focusing on improving the basics and reducing the price. Right now virtual reality is the only thing that I like among upcoming smartphone technology. Everything else, like fingerprint scanners and multi window mode is fun, but completely not needed. But what I really hate are smartwatches. They do way less than your smartphones can already do. They're completely useless.